The Gahanna Foundation was established, in July of 2018, as a charitable 501c3 non-profit. As per the IRS application, "The mission or purpose of The Gahanna Foundation is to raise funds through grants, gifts and endowments to fund projects directly or indirectly related to the Olde Gahanna Sanctuary (OGS) and/or worthwhile neighborhood projects." 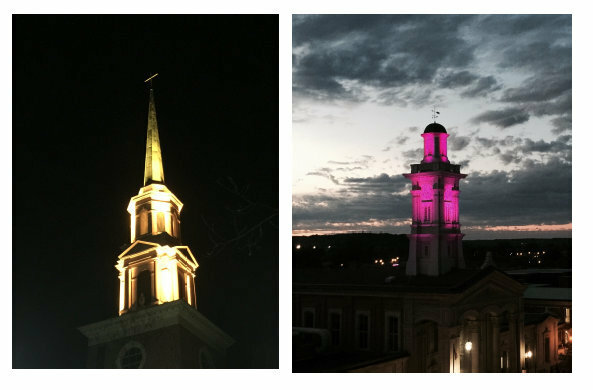 TGF's first bright idea is to light the historic bell tower atop the church built in 1895 in Olde Downtown Gahanna,at the 4-way-stop intersection of Town and North High Streets. Chris Apfelschtad, central Ohio's lighting guru who heads up Light Up Columbus will install a dozen LED lights that span the rainbow. The long-dark tower will become a beacon of electric art that visitors, locals and tourists will want to see again and again or night after night. Gahanna's pending era of "enlightenment" will illuminate OGS' biggest, natural business card, the bell-less and until recently neglected tower. Plans call for the octet of arches to have louvers restored to resemble those from the late 19th century. Growing Gahanna can use the glowing tower to outshine the competition. The community may want to see it as lighting the path forward toward more civic-minded action and interaction with like-minded groups. Others may want to partner with The Gahanna Foundation on co-productive projects or initiatives. Gahanna Mayor Tom Kneeland isn't shy about expressing his enthusiastic support for the project. "The Sanctuary has been that 'Silent' historical icon that would literally 'Come to life' with this lighting project." Before he was elected mayor in 2015, Mr. Kneeland served on city council for 20 years, so he knows his history and sees the future. "Olde Gahanna and the Creekside District will shine brighter with private investment projects like this. My family and I will be contributing to the lighting effort because it's a great project." Whether you were born in Gahanna or raised here, have a business presence or moved here recently as my wife and I have, your generous and charitable donation to TGF for this and future projects will be a grassroots-plus showing. For OGS itself, and its surrounding Creekside business neighbors, please join to help TGF help Gahanna light the night, and light the way forward. To keep up Gahanna Foundation news, visit the TGF Blog above.